Spend some time at Hancock Shaker Village while at our Berkshires Bed and Breakfast. Hancock Shaker Village is always an interesting place to visit. Shaker communities are uniquely American, though their origins can be traced back to French and English groups in the 17th and early 18th centuries. In 1774, a small group of Shaking Quakers led by Mother Ann (Ann Lee) traveled to the New World to establish a communal utopian society based on purity, pacifism, tolerance and gender equality. Many people at the time were interested in creating such utopian societies, but the Shakers were by far the most successful. By the early 19th century, there were approximately 6,000 Shakers in America. There are no Shakers today, but their legacy remains in the beautiful architecture and furniture they created. Shaker Villages in Maine, New Hampshire, Massachusetts, New York, Connecticut, Ohio, and Kentucky reveal much about what the Shakers valued. They embraced simplicity, but they valued inventiveness. They believed in hard work, but they appreciated tools that facilitated that work. Their buildings and furniture were functional, but they were also beautiful. They still are. It is worth noting several upcoming events at Hancock Shaker Village, which is close to our Bed and Breakfast in the Berkshires. Country Fair, September 24 & 25, 2011. Celebrate the bounty of the harvest. Enjoy wagon rides, a Farmers Market, and agricultural demonstrations. Many local and regional craftspeople and artisans will be on hand, demonstrating their skills and selling their products. Live music, a pie contest, and a quilt show round out the event. Please see Country Fair for details. Shaker Suppers, October 22 & 29, November 5 & 26. 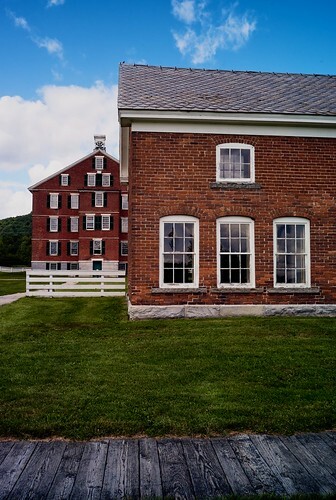 Enjoy a guided tour of Hancock Shaker Village, led by interpreters in period attire. A cider and cheese reception in the kitchen of the historic Brick Dwelling (beer and wine available for purchase) will be followed by dinner in the Believers’ Dining Room. Feast by candlelight on dishes inspired by The Best of Shaker Cooking, by Amy Bess Miller. To purchase tickets, please visit Hancock Shaker Village. Choose Your Own Shaker Adventure, ongoing. Interested in a specific aspect of Shaker culture, such as Shaker Spirituality or Shaker Inventions and Innovations? You may create your own custom tour. More information is available at Hancock Shaker Village. We’re happy that Hancock Shaker Village is so close to our Berkshires Bed and Breakfast. We feel like we understand why they settled here, back in the late 1780’s . There is something utopian about the Massachusetts Berkshires.